Let's be upfront about this: There are a lot of Easter eggs and DC Comics references in the pilot for The Flash, which aired tonight. The opening introduction -- "I'm Barry Allen and I'm the fastest man alive" -- is a obvious homage to Mark Waid's long run on The Flash. Back then, Barry was dead and the series lead was Wally West...but every issue (plus/minus a few special circumstances) started out with expository dialogue that began, "I'm Wally West, and I'm the fastest man alive." Waid, by the way, loved the pilot. Elements of DC Chief Entertainment Officer Geoff Johns's Flashpoint and Flash: Rebirth permeate the story. Rebirth was key to bringing Barry Allen back to the forefront after he had been resurrected in Final Crisis, more than 20 years after his death in Crisis on Infinite Earths (more on that later). The most important such element is that Barry's mother was murdered when he was a kid, something that was invented by Johns and not part of Barry's Silver Age backstory. You see that yellow ball of lightning in the shape of a guy? That'd be the Reverse Flash, one of a number of Flash villains tied to the same "Speed Force" that gives Barry his powers. He's Barry's archenemy and might, in fact, be closer than you'd think. ...And, yes, the presence of Reverse Flash in Barry's childhood means time-travel was likely involved. The star of the first-ever live-action series based on The Flash, John Wesley Shipp plays Barry's father in the pilot and will apparently recur throughout the series, since we've seen photos of he and Barry together while Barry is in costume in the Fall TV Preview episode of Entertainment Weekly. Here, we just see him at the beginning and the end, witnessing and then suffering the fallout from his wife's murder. In the comics, Barry Allen is always late, which of course is HI-larious when you take into account that he's got super-speed. I don't remember enough early Silver Age stuff to know whether he was always late (although that seems to be the approach Johns has always taken), and thus was an ironic personality trait that his powers played into. For years, I always assumed that it wasn't that he was actually slow so much as it was that, like Superman, he seemed unreliable because he was never able to account for his whereabouts when he had to be The Flash. The cantankerous captain at the scene is actually Barry's boss from the comics. Expect to see more of him. Wait a second. What did Iris call the particle accelerator? Oh, "Atom Smasher." Like the guy from the Justice Society of America who was a big player during the Geoff Johns run. Got it. In the comics, only one of the Mardon Brothers is bad. Here, it seems both of them are -- but the one who's actually a supervillain in the comics is the one presumed dead when the plot of this episode takes place. That means that his brother, the pilot's villain and the one we actually SEE die, can be a motivating factor for the "real" Weather Wizard when he pops up down the line. Iris does reference Barry's trip to Starling City, and he totally downplays the whole Felicity thing, apparently implying that it all just made him more sure he wanted Iris. She misses the point. A setting we saw on Arrow last season, S.T.A.R. Labs is the DC Universe's biggest super-science facility. Not a comics character...but close. There's nobody by that name in the DC canon that we can find, but there's a Garrison Slate, who founded S.T.A.R. Labs. The Garrison/Harrison similarity is enough for us to stick it here, especially since Harrison's actual identity will be a big mystery this season. This is probably Eobard Thawne, a Flash villain from the future and the man responsible for the death of Barry's mother. No promises, though, they might like to surprise us. Thawne is from Keystone City, Central City's twin...which is where Golden Age Flash and Barry's nephew Wally West lived! The reporter who was on TV the night of the particle accelerator accident? Linda Park. Or at least, she was on Arrow. She doesn't have a name onscreen this time. That would be the reporter wife of Wally West, Barry's nephew and the third Flash in the pre-New 52 DC canon (recently, he's been reintroduced in the New 52 and Greg Berlanti has said he'd like to bring Wally into the TV show sooner or later). We haven't seen Linda in the past few years, but it's interesting to note that she's older than Barry here. So...how old is Wally, then? I've talked about this before: Barry's murder board isn't actually Rip Hunter's chalkboard, but it's a clue-filled narrative device that Geoff Johns likes to use, epitomized by Rip Hunter's chalkboard in 52 and Booster Gold. Caitlin Snow, who appears here as the female S.T.A.R. Labs tech played by Danielle Panabaker, is better known as Killer Frost in DC Comics. Cisco Ramon, the other S.T.A.R. tech, is actually a Justice League member from time to time. This guy is on top of his references, too; he not only drops the word "vibe" into conversation in a brief guest appearance on Arrow last season, but follows it up by blasting Slade with a super-weapon that discharges energy that seemingly functions like Vibe's powers do in the comics. We already talked a bit about this. 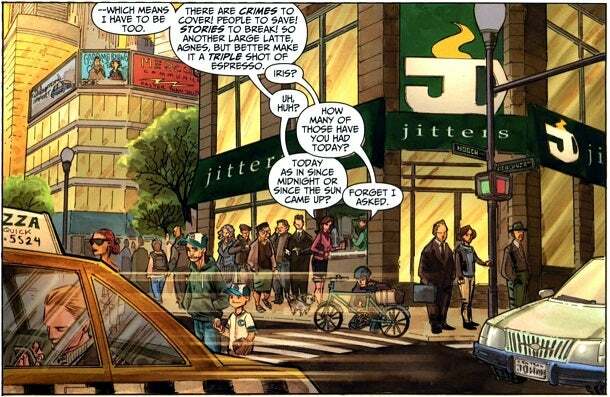 The coffee shop where Iris works is a DC Universe locale featured in New 52 issues of The Flash. There is an "Iris" behind Barry when he goes to see Iris. Not sure what that business is or why it's there, but there it is. 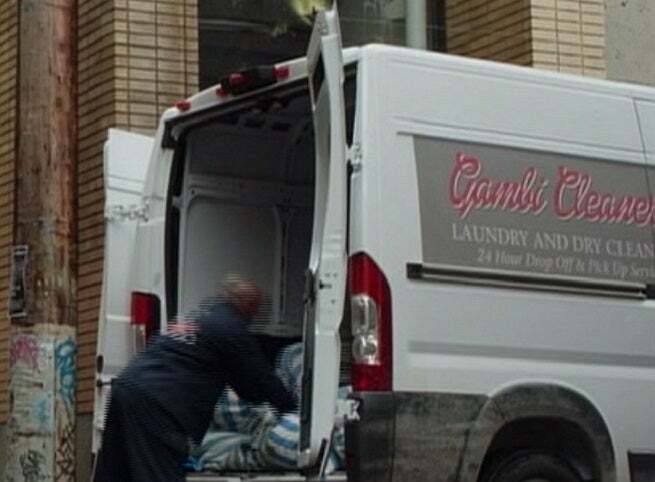 That laundry truck belongs to Gambi Cleaners. In the comics, Peter, Paul and Anthony Gambi are brothers, tailors, and, in the case of Paul, the guy who designs the costumes for most of FLash's rogues gallery. Lucky for them, he's already set up in Central City, huh?! Hey, look! That airstrip is where Green Lantern works! Headset is designed to combat "battlefield impulse noise"
Heh. "Impulse." That would be the name of Barry's grandson, later Kid Flash. ...Except we know he didn't, because he's Firestorm and will be appearing on the show shortly. That's an odd offhand comment to make. Ol' Eddie does certainly seem committed to getting himself ingrained in Barry's life, though, doesn't he? Just like Ollie's mom in Arrow Season Two! That's what DC Comics calls their super-people. Check out more details here. DC Comics's multiverse was discovered in the Silver Age when The Flash broke a dimensional barrier and bumped into his Golden Age counterpart, Jay Garrick, revealing the "hidden" city Garrick lived in, Keystone City. Antimatter, too, huh? That plays into a lot of DC's multiverse stories. This, too, we already talked about. Hey, look! There's Oliver Queen! And his final bit of advice -- "wear a mask" -- is becuase (for the four of you who don't know) it was Barry who designed and made Oliver's mask for him in Arrow. There's also apparently 600 miles between the two cities. 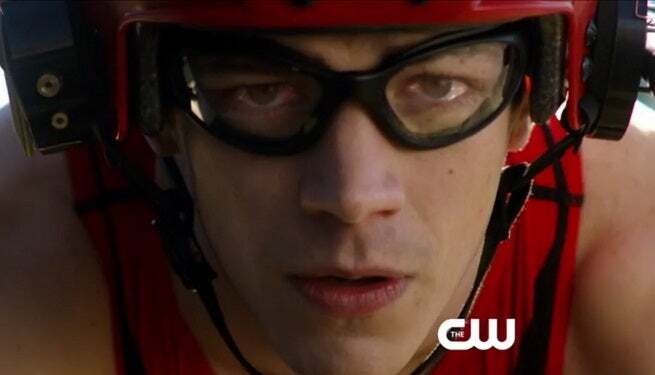 That Oliver Queen offers Barry the advice that he has to wear a mask when superheroing is a nice bit of self-referential humor; in Arrow, it was Barry who designed the mask Oliver now wears as Arrow. Yeah, this cyclone thing is one of the most frequently-cited powers of The Flash. That newspaper, holy crap: 2024 is the year "The Last Days of Animal Man" happened, but more than that, Crisis seems to be on a ten-year cycle. And, yeah, That's the big-C CRISIS there. See the red skies headline? More on that here. Also, there's Batman, now officially existing in the Arrowverse.